Each "Show/Hide Assumptions" gives the parameters the simulation deems to be realistic scenarios and explains the basic assumptions used as the basis for those parameters. Anything below these parameters will result in a lower "Reality Check" score beneath the graph. These lower parameters could be useful as the basis for guided questions. Suggest reviewing it in the context of the lesson from which it was extracted, before using on a stand-alone basis. 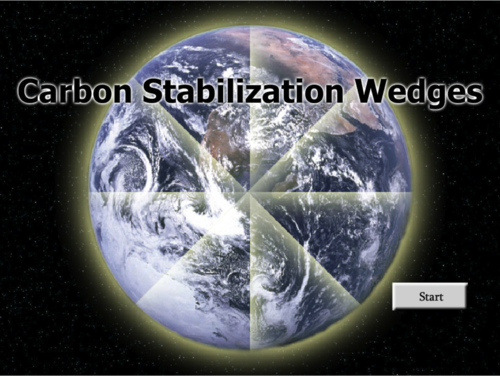 See CLEAN resource Stabilization Wedges Game [link http://serc.carleton.edu/resources/41709.html] for a hands-on carbon stabilization game that has a lot of background information. The tool shows the potential increase in carbon emissions over the next 50 years, subject to modifications made by the user in various technologies that impact carbon output. Assumptions are provided for each set of variables. Tool allows the user to change multiple factors from the multiple categories shown in the various drop down menus at once in order to see the aggregate effect on projected carbon emissions. Comments from expert scientist: Presents most of the critical ideas relating to carbon stabilization wedges. Ability to change multiple factors at once lends to process of authentic inquiry by users and provides an excellent base to create inquiry-based activities. Provides a great base for how models and/or science can inform decision-making on a societal level. Use of green/red in graphs may create barriers for students with color blindness.